Dial Books for Young Readers, 2017. 385 pages. 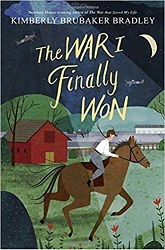 The War I Finally Won is the sequel to the wonderful award-winning book The War That Saved My Life, by Kimberly Brubaker Bradley. It was my #1 Sonderbooks Stand-out in Children’s Fiction for books I read in 2016. Yes, you should read the first book first. The book begins with Ada having surgery to fix her clubfoot so she can walk without crutches. But the war is going on, and a lot of people she knows are dying, including her Mam – which means that Susan can become Ada and Jamie’s legal guardian. Susan’s house was destroyed in the first book – but Lady Thorton gives them a home in a “cottage” on her estate – a bigger place than Susan’s house had been. However, things get smaller when Lady Thorton moves in with them after her stately home is requisitioned by the government. And then Susan is asked to tutor a 16-year-old German Jewish girl named Ruth. Lady Thorton doesn’t want to have anything to do with a German girl, because her son is in harm’s way fighting the Germans, but she has to give in. Ada only gradually comes to understand that Ruth hates Hitler just as much as they do. Ada still has the same voice as in the first book. There are still a lot of words she doesn’t understand because she has no experience with them. And she still is prone to emotional outbursts, still has trouble feeling safe. This book explores many aspects of what it means to be a family. It was marvelous watching Ada’s fragile heart open wider, even while dealing with the hardships and tragedies of wartime. Sonderling Sunday – Seltsamen Sonderlinge – The Return of the Belgian Prankster! 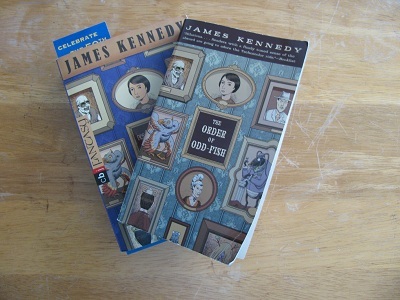 Tonight it’s back to the especially Sonder-book, Der Orden der Seltsamen Sonderlinge, which is the translation of The Order of Odd-fish, by James Kennedy. The first sentence of Chapter 24 is a perfect sentence for translating. I’m sure you want to know how to say this, should you ever be in Germany! = Die Rückkehr des Belgischen Scherzkekses löste in der ganzen Stadt einen wahren Tumult aus. = Die Menschen dort trugen alle denselben panikerfüllten Gesichtsausdruck zur Schau. = Niemand wagte es auch nur, in seine Nähe zu kommen. = Die Menschen ertragen es, in Angst und Schrecken zu leben, aber keiner nimmt es hin, gelangweilt zu werden. = Nichts schien der Anstrengung wert zu sein. Sie war wütend und angewidert, fasziniert und verängstigt und fühlte sich trotz allem zu ihm hingezogen. Here’s hoping you never have occasion to use that sentence! That’s all for tonight! Until next time, may you not be terrified or bored! Embers Press, 2013. 239 pages. Big thanks to my friend who recommended this book to me. In many ways these thoughts were how I was leaning – they seem like a natural outgrowth of universalism – but I’d never seen it articulated quite this way before. What if Jesus alone is really all we need? What if Jesus is the gospel and not the many things we make it? Could it be that Jesus wasn’t a Christian, wasn’t the founder of Christianity, and isn’t owned by Christianity? How could Jesus’ simple invitation “Follow me” be his most revolutionary words? What if God has planted seeds in all the world’s cultures to prepare people for recognizing Jesus as someone special? What if Jesus never commanded us to convert people to a religious system? Is there any chance that it might be possible to be a genuine follower of Jesus and still be a Muslim, Hindu, Buddhist, animist, or agnostic? Is it possible that Jesus is the name above all names and not limited to any socio-religious community – not even yours? This book’s premise is that those last questions can be answered with Yes. And the book explains why and what the ramifications are. That idea alone – that’s what shook me up. 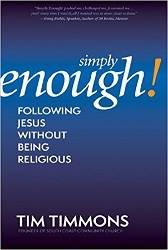 The rest of the book wasn’t as striking to me, but it did renew my desire to simply follow Jesus. Honestly? This book doesn’t motivate me to want to change churches until I find a group who believes exactly the same things I do. I attend a church full of followers of Jesus. I like the songs we sing and the form our worship takes and the sermons preached and the small groups who speak into my life. I don’t agree with every point of theology that the senior pastor makes. But he is a follower of Jesus and encourages me to follow Jesus, and that’s enough. This book looks at the ways that we forget that Jesus trumps everything, and he needs to be my end game. Please listen carefully to this statement: Unless Jesus is your end game, then your life amounts to nothing. Jesus said it himself: “Apart from me you can do nothing.” The apostle Paul agreed, saying that his entire life and his accomplishments were a pile of rubbish (actually manure) compared to knowing Jesus. Without Jesus as your end game, your life will be filled with frustrations in your religious experience. You will have disappointments with life’s expectations, anxiety over whether your children will follow in your religious traditions, concern over the lifestyle decisions of your children and grandchildren, fears for your future security, terror over immediate financial concerns, and discouragement with life’s results. This book encourages me to not try to convert people. Tell them about Jesus, but let them keep their own culture. And to stop expecting other people to jump through hoops to please God. It’s all lovely and liberating and reminds me what’s actually important. Source: This review is based on a book I purchased via Amazon.com. Candlewick Press, 2017. 36 pages. You will note that Wooliam is reading. There are not many sheep who read. But Wooliam is one of them. This is Baabwaa, also a sheep. In this picture, Baabwaa is knitting. Knitting is a very practical hobby for a sheep. It’s surprising not more of them do it. Reading and knitting! These are my kind of sheep! 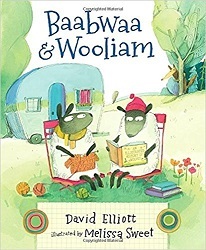 One day, when Wooliam has been reading about adventures, he suggests that they set out to have an adventure of their own. It’s not easy to find an adventure in a field with a stone wall around it. But then, they are approached by another sheep. A sheep with a long, rangy tail. A sheep with a sharp, whiskered snout. A sheep with a filthy wool coat. However, well-read Wooliam recognizes the Wolf in Sheep’s Clothing from his reading. After some chasing, the wolf wants to find out more. Wooliam has read about him? Eventually, the sheep develop a friendship with the wolf. Wooliam teaches him to read, and Baabwaa knits him a better sweater. But there’s still a fair amount of chasing. The sheep needed some exercise anyway. And they decide it was quite an adventure, after all. 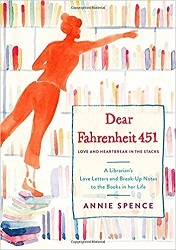 This book is quirky, warm, and fun. It even gives a message about the value of reading. Melissa Sweet’s illustrations are also quirky, warm, and fun. As it happens, I was planning on doing a preschool storytime this week about “Adventures,” and this book will fit in perfectly. Friendship is one of the best adventures of them all. Sleeping Bear Press, 2017. 32 pages. How’s that for a catchy title? I had to find out about the skydiving beavers! This nonfiction picture book tells about an effort in 1948 to move beavers from a lake where people had settled to Idaho back country wilderness. The place where they wanted to relocate the beavers was so wild, it didn’t have any roads or railroads. So how to get the beavers there? Horses or mules wouldn’t be too happy to transport angry beavers, and that would take a long time. A man named Elmo Heter, who worked for the Idaho Department of Fish and Game, came up with a plan. They had plenty of parachutes leftover from World War II, and they decided to use them to transport the beavers. After a while, it seemed Geronimo was growing to like all the skydiving. Each time he touched down and the box sprang open, he’d scurry out . . . then crawl right back in for another go. Eventually, they used the parachutes and self-opening boxes to transport seventy-six live beavers into the Chamberlain Basin region. A note at the back gives more details, but also explains that today we try to find ways to live with beavers, because beaver communities are great for the environment. The note tells about a successful such effort in Martinez, California. There’s also a list of surprising facts about beavers. 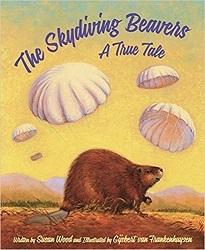 So even though it will probably never happen again, it was fun to read the true story of the skydiving beavers! Recorded Books, 2015. 9 hours 15 minutes on 8 discs. 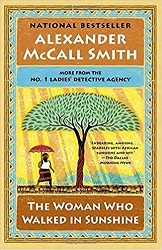 This is the 16th book about Precious Ramotswe of the No. 1 Ladies’ Detective Agency in Botswana. There were still times when I was annoyed with the slow plot arc, since more than once Mma Ramotswe was thinking long and hard about whether she should talk to Mma Makutsi. But the overall story had the usual one or two interesting cases. 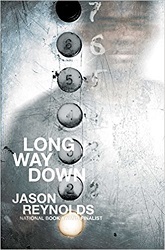 This time there was one about a scandal in the past of a late government official as well as the story of a little street boy who vandalizes the tiny white van. But the overall story is about Mma Ramotswe going on holiday. It’s not her idea – her staff seem to be conspiring to get her to take one. Now that she’s a partner, is Mma Makutsi plotting to take over the agency? However, taking a holiday is more difficult than it would seem. Truly, a woman with a loving husband is like a woman who walks in sunshine. Listening to this book will bring sunshine into your life. 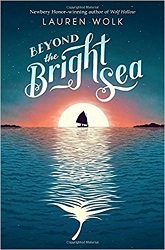 Beach Lane Books (Simon & Schuster), 2017. 40 pages. I’ve got a new favorite Autumn storytime book. 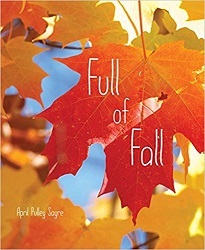 Full of Fall tells about the changes in a forest in Autumn – with stunning photo illustrations and simple but not trite rhyming verse. Here’s an example of the text for two spreads, with appropriately shaded brightly colored leaves under these words. And ends with leaves fallen, on the forest floor, and geese flying overhead. As with so many Autumn books, the last page foreshadows the coming of winter – with a photo of snow falling on colored leaves. The text is simple enough for a baby storytime, but the photos and concepts are interesting enough for a preschool storytime. The large photos make this book extraordinary – but the well-chosen words make it readable. There are two pages at the back that explain some of the science shown in the pictures, for use even with school age children. You are currently browsing the Sonderbooks blog archives for November, 2017.